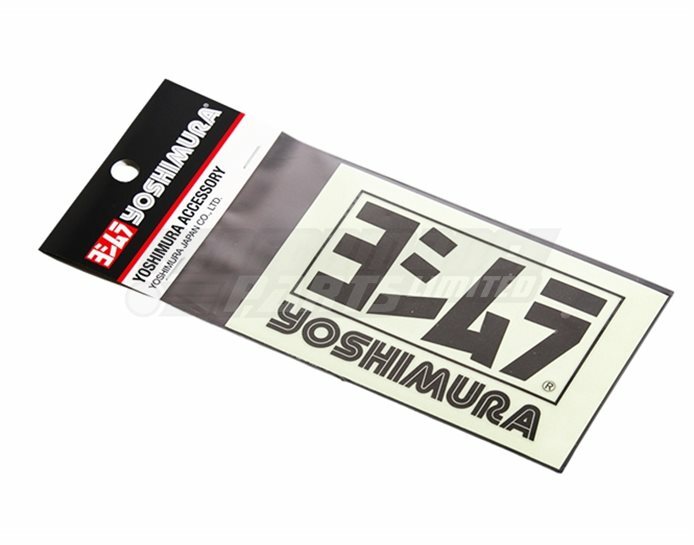 Yoshimura logo sticker measures 85mm x 56mm. 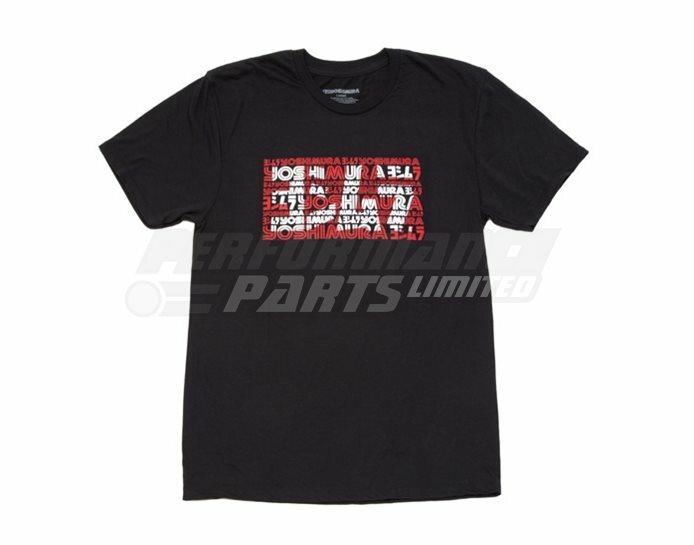 Show the world your "Yoshimura Spirit" with their range of Official Apparel. Started by Hideo “Pops” Yoshimura way back in 1954, the company is still under family ownership and Yoshimura has evolved into one of the world's largest motorcycle aftermarket performance companies. Having R&D and manufacturing facilities in both Japan and the USA, Yoshimura have been involved with racing at the highest level, all over the world for nearly six decades! That level of experience is unrivalled and shows through in the innovation and quality of their products. Yoshimura bring the skills, knowledge, and passion of racing into everything they make or do, whether it be CNC machined hard parts, exhaust full systems or slip-ons, tuning parts or a full engine build. Yoshimura engine plugs are CNC machined from 6061 T6 alloy, hard anodized and topped off with laser-etched logo. Kit includes Small and Large Timing Inspection Plug for a complete look. Yoshimura Bar Ends are designed as direct replacements for those bulky and heavy stock bar ends. CNC machined from billet alloy, hard anodized and then laser-etched with the Yoshimura logo. Yoshimura has proved once more that even the most simple of parts can have room for improvement. Like the other parts in the range, these are CNC machined from billet alloy, hard anodized and then laser-etched with the Yoshimura logo. Most are also pre-drilled for lock wire. Paying attention to the minor details is the way that Yoshimura has won so many titles over the years. These clever stand bobbins are an easily installed upgrade that won't get marked as quickly as other stand stoppers, because they rotate with the stand. A hard anodized finish also adds longevity. Manufactured with a laser cut stainless mounting bracket fitted with a CNC machined alloy LED number plate light which is anodised black then laser etched with Yoshimura's logo. The anodised black alloy number (license) plate frame also has the Yoshimura logo. (NB - Logo will be hidden with UK legal size number plate). Yoshimura CNC machined alloy steering stem nuts are hard anodized and laser-etched for a technical look and you won't have to struggle drilling safety wire holes, because it’s already done! Cover up those mirror holes with our feather-weight Mirror Hole Cap Kit. Each piece is CNC machined from aircraft-grade aluminium, then laser-etched with the Yoshimura Logo. The back sides are hollowed out and replaced with carbon fiber inserts, further reducing weight and giving them an attractive appearance from the front. These caps are ridiculously light weight! This light-weight Front Sprocket Cover is a great alternative to plastic OEM covers. It not only adds a noticeable amount of class to your bike, but functions exceptionally well. The CNC machined aluminum cover with carbon fiber backing, mounts closely to the sprocket and surrounding area, which eliminates virtually all chain grime from being flung out from the sprocket. Helps keep your bike and riding gear cleaner for longer. Yoshimura case savers are designed to minimise engine case damage from light crashes and scrapes, something which is now demanded by most race series organisers. Developed with CAD software, Case Savers are CNC machined from high-quality billet 6061-T6 Aluminium to minimise weight while providing great strength. Each Case Saver features a hard anodized finish to improve durability and appearance, and a CNC machined Yoshimura logo. Yoshimura Chassis Protectors help minimize damage from sliding type falls, often saving thousands in repairs. The plastic construction is soft enough to slow slides and wear down slowly... yet tough enough to keep the track and road away from your bike in most cases. Anyone who has tried to adjust their chain with OEM style axle adjuster blocks knows the frustration of dealing with low quality material nad poor markings. These Yoshimura units are lighter weight, stronger than the factory ones, and look great too. It goes without saying that legendary Yoshimura quality is built into every adjuster block. Provides a more linear-rate suspension geometry by changing rear suspension ratio and allows for adjustment of rear suspension geometry to improve traction characteristics. In racing, every gram of weight saving counts. With their perfect mix of style and functionality, these Yoshimura Rear Sets won't disappoint! They are the quintessential accessory for your street or track Super Bike. Machined from billet 6061-T6 Aluminum providing the best in quality, the rear sets are then anodized black providing excellent appearance. The Yoshimura R&D logo is proudly laser etched, signifying quality backed by a history of performance and racing heritage. The Yoshimura rear sets offer multiple adjustment positions to fit all riders’ needs while providing the best in control and feedback. Yoshimura Aluminium Rear Set Brackets are the perfect answer for those needing a little more adjustment from the stock foot controls. These Brackets feature two additional mounting positions over the stock location for increased possible ground clearance and lean angles. They also enable more aggressive body positioning for better body and weight transfer on the bike. Dropping weight is one of the most efficient ways of improving performance. Take weight savings to max with a lightweight aluminium exhaust bracket. Constructed from .8mm stainless steel these covers are designed not only to look smart but also reduce the clogging of the radiator fins and prevent damage to the radiator by stones flicked up from the front tyre. Maintains cooling whilst giving protection. Don't rub your eyes, step back and enjoy the scenery. This is a high-quality, EI-LO brand premium tee, made with ring spun cotton and a lotta love. 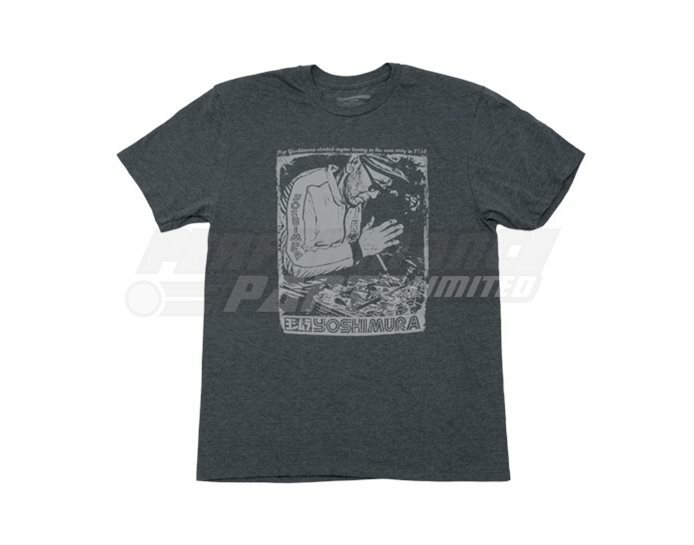 What says cool better than an image of Pops Yoshimura working his magic? High quality EI-LO brand premium tee made with ring spun cotton. It is not obligatory to give consent to be added to our mailing list to join the club, but for full benefits it is important to tick the box for email correspondence, so that we can contact you about the specific news and offers we have applicable to your specific model of bike. We will never share your data with any third party, and we will only contact you with products and offers specifically of interest to you.